Participants utilize the sanctuary of this affiliation to provide input while improving their environmental programs and thus the success of their respective companies. Since 1981, the AHC Group has assisted organizations and individuals in the field of environmental and management strategy. 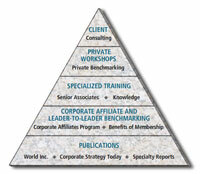 As consultants and researchers to a wide variety of organizations, both public and private, we serve as trusted advisors to middle- and upper- management staff and key officers whose responsibilities include environmental health and safety, public relations, governmental affairs, corporate governance, social responsibility, communications, and investor relations. discover what is actionable by linking the needs of corporations with external demands for new products in a social response context. Through our Corporate Affiliate Program, Senior Associates, and network of thought leaders and leading practitioners of change strategies, we aggressively facilitate a constant conversation on the near-future. We deliver results with compassion and concern for corporate risks. We are change agents of consequence with a unique angle on tomorrow — bridging our coalition of leaders through bold disclosures and helping build better businesses, products, and companies through our time-tested approach to conscious capitalism.